The P Smart 2019 is equipped with a 6.21-inch IPS display with a dewdrop notch in the middle. It's got a tall aspect ratio of 19.5:9 and a 2340x1080px resolution for a pixel density of 415ppi - pretty standard numbers these days. In our testing, the P Smart posted average results for brightness and contrast. There's no boost in auto mode, and the 430-something nits you can get in manual is the ceiling in auto as well. You can get more nits from some of the competition and the one phone in this bunch that does crank up the brightness in its auto mode, the Galaxy A7 (2018), is actually the brightest. Under direct light, the P Smart 2019 fares decently and produces an average contrast score for its class. It's a noticeable improvement over the old model and it's also superior to the Honor 10 Lite, but the OLED displays of the Galaxy A7 (2018) and the vivo V11 will remain more easily legible out in the sun. We've been saving the best bit for last - the P Smart 2019 can be spectacularly accurate in representing the sRGB color space. In the Normal+Default display setting it achieves an average DeltaE of 1.2 but a slight tweak with the color wheel brings that down to a negligible 0.6. Of course, that's not the default mode, because people tend to prefer livelier colors. The Vivid+Default setting (the actual out-of-the-box state) delivers those, but it also renders slightly bluish whites though it still manages a decent average DeltaE of 5.5 when compared against an sRGB target. One issue we observed that doesn't fall into any of the usual categories is the less than ideal uniformity of the panel. On bright screens you'll be able to notice some dimming around the edges - it's not a deal breaker, but it's the type of display flaw we thought we had left in the past. The P Smart 2019 packs a 3,400mAh battery, up from the 3,000mAh of last year's model. It does have a larger display area to light up, to the tune of 15%, which is that extra bit more than the bump in capacity. The newer and more efficient chipset played its role too, and this year's model showed vastly improved endurance in standby and 3G voice calls, slight increase in video playback longevity and a minor (within the margin of error) decrease in Wi-Fi web browsing. Neither screen-on test returned spectacular numbers, but 10 hours of looping our web script and 11 hours of video playback are quite reasonable results. Overall, the P Smart 2019's Endurance rating works out to 88 hours - a tangible 15-hour improvement over the predecessor. Our battery tests were automated thanks to SmartViser, using its viSer App. 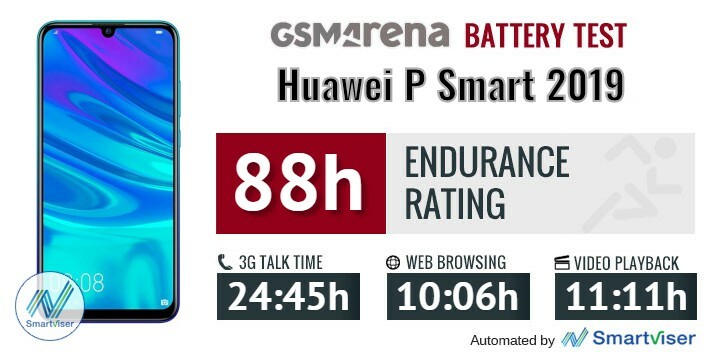 The endurance rating above denotes how long a single battery charge will last you if you use the Huawei P Smart 2019 for an hour each of telephony, web browsing, and video playback daily. We've established this usage pattern so that our battery results are comparable across devices in the most common day-to-day tasks. The battery testing procedure is described in detail in case you're interested in the nitty-gritty. You can check out our complete battery test table, where you can see how all of the smartphones we've tested will compare under your own typical use. We were gearing for some heavy ranting after we saw the plain 5V/2A charger, but in reality it filled an empty battery in 1:42h which isn't too shabby. Sure, the 36% we got after a 30-minute stint isn't mind-blowingly fast, but the whole charging experience wasn't really rant-worthy. The P Smart 2019 has a single loudspeaker - a classic bottom-firing one next to the charging port. It's plenty loud and won't leave ringtones unnoticed, but using it for any sort of music playback is likely to disappoint you due to some clipping at high volume and distinct lack of punch in the low frequencies. 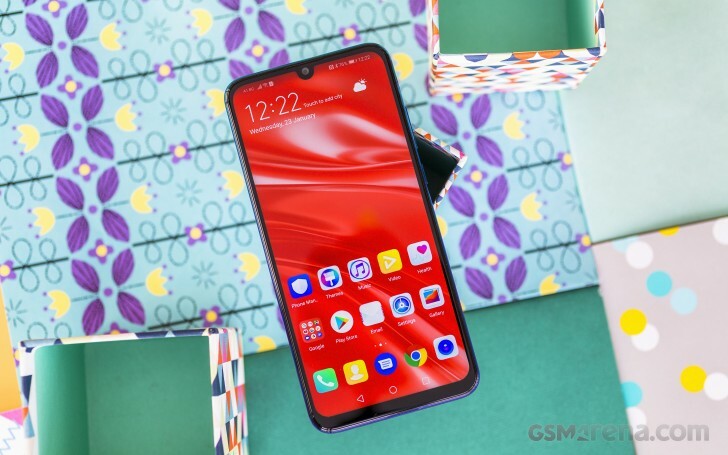 The Huawei P Smart 2019 had above average loudness with an active external amplifier and excellent scores across the board, which was a very promising start. Unfortunately, headphones did quite a lot of damage - volume dropped to way below average, frequency response got somewhat shaky and some intermodulation distortion crept in. Stereo crosstalk increased by an above average amount too, adding up to a rather mediocre performance in the more important part of the test.